Bank & Vogue offers a wide variety of sporting good and camping store returns, including out-of-season goods, from a major US retailer. These retailer have over 100 stores across the Southern, Midwest and South-East United States. The returned sporting goods and camping gear including items that have been returned to the retailer, overstock items that were never sold and items that have gone out of season. 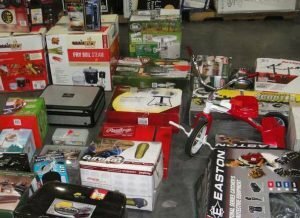 These items may also be purchase from camping or sporting good stores that are closing and are hating a camping and sporting liquidation. Bank & Vogue than purchases the wholesale sporting goods and camping gear to sell to companies in North America and internationally. Contact Bank & Vogue for further details and logistics arrangements. Each container include twelve to thirteen gaylords of smaller packed sporting goods with six to seven oversized pallets (6×4 feet) of larger sports goods. 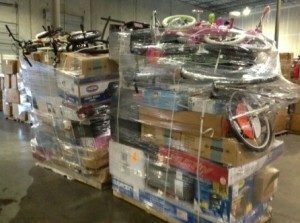 These include tents, BBQs, bikes, exercise equipment and more. Larger products such as exercise equipment can be excluded from these loads at your request. All loads are palatalized and are seasonally influenced. If you’re looking to buy unused sporting goods or camping gear at a wholesale price contact us today. Bank & Vogue’s team of logistics experts will help determine the shipping arrangements necessary to fulfill your order in a timely manner.